Rolls-Royce has made plenty of mistakes in recent years. After corruption and bribery charges, consecutive profit downgrades and a cut in the dividend, investors have extracted their pound of flesh for these mistakes, resulting in significant share price underperformance since it last peaked in December 2013. We believe the cost of these past mistakes is reflected in the share price. However, what is not being reflected is a significant market share position in the aerospace engineering industry, management’s commitment to cost savings, and strong underlying demand that is supportive of future margin improvement and significant growth in free cash flow. Can a company be bigger than its brand? Rolls Royce may conjure up images of the life and times enjoyed by the residents of Downtown Abbey; however Rolls-Royce Holdings Plc is a modern and progressive company that enjoys a dominant position in its chosen markets. Whilst they no longer manufacture the luxury British car its name has become synonymous with, it is a global leader in the development and manufacture of power and propulsion systems. The company ceded its motor cars business to BMW in 1998 and today is comprised of five main divisions – Civil Aerospace, Defence Aerospace, Power Systems, Marine and Nuclear. 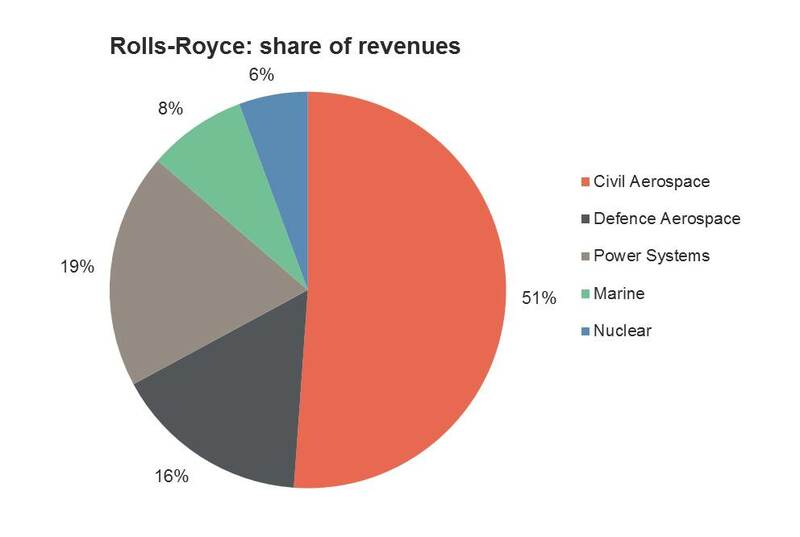 The majority of its earnings are derived from the Civil Aerospace division, where Rolls-Royce is the number-two player. The company’s Trent engine series propels many of the Airbus A380 super jumbos and Boeing’s Dreamliner fleet operated by major airlines around the world today. Their current share of the wide-body engine market is 38%, presently behind General Electric’s dominant 54% share. However, a pipeline of new engine designs will likely increase Rolls-Royce’s share to 50% by 2020. However, the fortunes for what many consider as the stalwart of British manufacturing have been mixed. Between 2014 and 2015 the company issued three profit warnings and saw its share price decline by 36%. Shortly after taking the helm in mid-July 2015, new Chief Executive Officer (CEO), Warren East, issued another profit warning and cancelled a £1 billion share buy-back. He then initiated a strategic review of the company, which resulted in a fifth consecutive profit warning. The share price reacted accordingly, falling another 35% in East’s first six months in the job. East hails from an engineering background, in stark contrast to the accounting background of his predecessor. He clearly likes a challenge, stepping down as CEO of ARM Holdings to join Rolls-Royce at a time when the company’s future was uncertain. Under his successful 12-year reign at ARM, East managed to arrest Intel’s growth in the mobile market by growing the number of devices which contained ARM semiconductor chips from 430 million to 9 billion. At Rolls-Royce he identified what he considered to be a “fundamentally good business with some of the best engineers in the world”. However, he also inherited an entrenched bureaucracy, an organisation that was burdened with the costs associated with multiple layers of management and an inefficient back office. Subsequent actions have seen the reduction of more than 600 management jobs and a streamlining of back office functions. More importantly, East has identified the need to rationalise manufacturing processes through the use of state-of-the-art technology to manufacture more while using less. Evidence of this transformation at work can be seen at Rolls-Royce’s facility in Washington, which manufactures the discs that hold engine blades in place. The facility has achieved a 50% reduction in the time it takes to make a disc, being able to run for 12 to 45 hours without any human intervention, compared to every half hour previously. In Singapore where the Trent 1000 engine is manufactured, a 27% improvement in turnaround times have been achieved, with management targeting a further 15%. While advances in manufacturing processes have required significant investment with capital expenditures running at two times depreciation and amortisation, they will have contributed to cost reductions totalling £200 million by the end of 2017. Modernising the manufacturing process will help drive an improvement in group margins from cyclical lows of 6.5% back to the historical average of 10-12%. At the same time the company has been labouring under the efficiency and cost burdens of a hierarchical management structure, they have also fallen victim to the nature of the product development and manufacturing cycle. Similar to General Electric and Boeing, initial sales of a new product are loss making due to introductory pricing, a lack of scale, and manufacturing inefficiencies. As the production cycle matures, costs decline and investors are rewarded with significant growth in free cash flow. Rolls-Royce will benefit from an expansion in deliveries of their large civil engines to over 500 by 2020 from 357 in 2016. Forward orders for the civil engineering division reached a record level of £76.4 billion in March this year. Market share is also set to improve, aided by its status as the exclusive engine supplier on a number of new aircraft models yet to hit peak production. In 2016 free cash flow was £100 million. Management is targeting this to grow to £1 billion in 2020. The driver of this improvement will be the civil aerospace division and as its production cycle matures, losses per engine unit will reduce and service revenue should increase significantly as a result of growth in the installed base. Large engine losses are currently £1.5-2 million per unit and reaching the 2020 break-even target alone would deliver a £600 million improvement in cash flow. Management have identified a series of cost and production efficiencies that are being targeted over the next few years. Taken together with a healthy underlying demand environment, we believe these management targets are achievable. However, the market is looking at the company through the prism of history and sees a company which has struggled to generate free cash flow for ten years. Hence, a degree of scepticism exists around management’s ability to achieve these targets. As fundamental investors, we see a company that is challenged by cyclically depressed margins, however with the ability to generate free cash flow above their historical peak as their new engine product cycle matures. Often a company trades below its intrinsic value because of previous subpar operational performance. In looking for investment opportunities, we focus on companies that are able to improve their historic performance, return significant free cash flow back to shareholders and adapt to new operating environments. In Rolls-Royce we see a company that has a capable management team which is committed to delivering on financial and operational targets to capitalise on its fundamentally strong market position. We are patient investors with strong conviction in our comprehensive assessment of Rolls-Royce’s future potential. The share price has already recovered this calendar year, indicating that the market has begun the process of re-rating the company. We have taken our position earlier this year when the stock was trading below its intrinsic value and we are happy to wait while the company pursues its growth initiatives and returns operating earnings to its full potential.